Quarterdeck Quilts was a dream come true for Sandy Martin Smith! She wanted to create a friendly place where quilters and seamstresses from the coastal area of Georgia and South Carolina could meet to share their enthusiasm. A place to discover new ideas and quench desires for the latest quilting and sewing products. Her success is Quarterdeck Quilts. 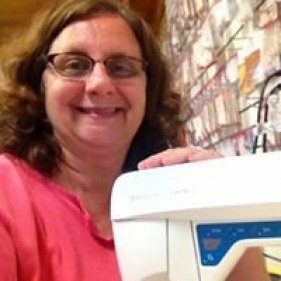 Sandy's lifelong love of sewing and quilting fuels her creativity and helps to stock Quarterdeck Quilts with the latest in quality fabrics and notions. Also wanting to provide a one stop shop with top sewing machines for the local sewing community, Quarterdeck Quilts is an exclusive Husqvarna Viking sewing machine dealer. You will find the most current models on the showroom floor including a variety of sewing machines, overlock machines and embroidery machines. Stop by; they are always ready to try. With financing available for qualified customers, taking home a fabulous new machine is easy. With a love for shopping almost as much as a love for sewing, Sandy is relentless at trade shows scouring and searching for the best tools for the job, the coolest fabrics, and quality, imaginative patterns for your sewing pleasure. The music we play at our shop all day is you saying "That's my next project!" or "I want one of those!" or "Way Cool". Join our merry band of stitchers! Come visit! And see for yourself.